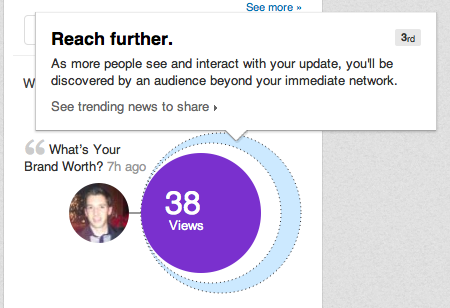 An update to the LinkedIn homepage has introduced a small analytics section for users. The section, located on the right-hand side of the homepage underneath “Who’s Viewed your Profile” provides statistics about the content the user shares. 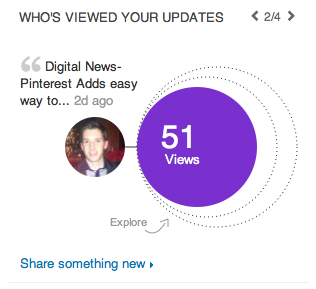 Using a simple circular chart, LinkedIn allows users several pieces of analytics. First off, it lets users see how many people have viewed their posts. This is displayed in the colored portion of the graph. Secondly, it alerts users when their posts have been shared outside of their connections. When content receives lots of engagement on LinkedIn, the “algorithm” on LinkedIn’s backend shares a post to the user’s 2nd network (their connections’ connections). This information is displayed as a user hovers over the middle circle in the graph. As engagement builds up, the posts are shared even further to those outside of the user’s 2nd network (essentially all of LinkedIn). This type of content is held within “LinkedIn Today”, which can be found at the very top of a user’s home feed. To see this information, the user must hover over the final circle in the graph. What value does the chart provide? It gives users the ability to know how their content resonates with their connections. If it resonates well, it receives more views. If it resonates even better, it gets pushed outside of a user’s second and then third networks. By getting engagement outside of their own network, a user is exposed to other people they may want to be connected with. The end result means a better way of anticipating how to grow their network, opportunities, and general exposure within their profession. While the analytics in this section may be slim, it is quite interesting and helpful for users. I wrote an article for Business2Community a few months ago that got shared outside of my 2nd network and was posted under “LinkedIn Today.” It would have been extremely interesting to see the statistics on that post, and likely would push me further to develop more in-depth content like that article.